Driving in silence down the narrow, sun-dappled roads it's hard to believe that minutes earlier you were surrounded by semis, caught in the frantic rush that is Interstate 95 in the near environs of Washington, DC. You are surrounded by forest – 15,000 acres of it – and you're only 30 minutes from the White House. 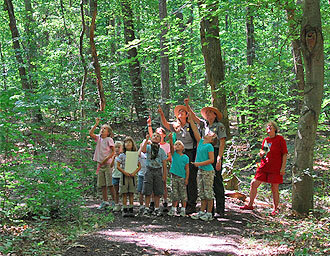 Prince William Forest Park – in this case the “national” in front of “park” is implied – is a vast oasis of untrammeled nature in a region where most of it has disappeared. Critters abound, including white-tailed deer, wild turkey, bear, and beaver. There are 37 miles of hiking trails and 21 miles of mountain bike trails. “You can do an 18-mile circuit hike without going over the same trail twice,” offers park ranger Laura Cohen. 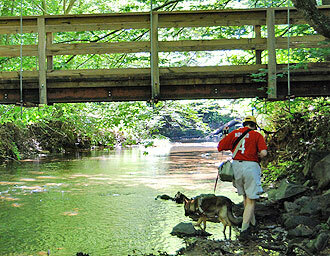 Waterfalls are common along the 18 miles of creeks and streams that crisscross the gradually rolling terrain of the park's piedmont forest. Want to wet a line? That's OK too – with a Virginia fishing license you are good to go after the park's bluegill, largemouth bass, and channel cats. If all that hiking and biking and fishing makes you hungry, try out one of the picnic areas, complete with charcoal grills. Or if you need a little shut-eye, spend the night. “Choose your level of rustic,” says Cohen, from pitching a tent in the backcountry, to four campgrounds, or more than 100 cabins built by the Civilian Conservation Corps in the 1930s, part of President Franklin Roosevelt's ambitious program to provide work for the unemployed. Today the cabins are evocative reminders of that time. Most are listed on the National Park Service's National Register of Historic Places. Saturday night visitors can settle in and listen to a campfire talk by a National Park Ranger about the park's environment or how archeologists have turned up evidence of 10,000 years of human habitation. Or find out where General Rochambeau's forces marched with George Washington on their return from the British surrender at Yorktown in 1781 – still visible as a broad rut in the forest floor. Or maybe – if you can keep a secret – how the park was used to train spies and commandos during World War II! Wild yet wildly accessible, Prince William Forest Park is one of those places you may not have heard of, but once you visit, you'll be back … even if it's just for a leisurely Sunday drive along the 11-mile scenic loop through rolling woodlands to catch your breath and lower your blood pressure … before heading back out to face I-95 once again. Visit the park's website for a full run down of activities.